Advanced scaling in is a technique where traders enter a position in stages while the price is actually moving against the direction of their trade. Advanced scaling in is a technique whereby traders enter a position in stages while the price is moving against the direction of their trade. It helps you achieve a better average entry price for your overall trade. It can help you take advantage of so-called retracements. The idea is that by entering the market several times when the price is pulling back from a trend, you can achieve a better average entry price for your overall trade. Note that advanced scaling in is very different from the standard scaling in technique, which sees traders increase their positions as a trade moves in their favour. This technique is not recommended for beginners. To use advanced scaling in, you first need to be able to identify retracements in price, as it is during these that you will place your mini-trades. The image below shows what a retracement looks like on a chart while a market is trending in an overall upwards direction. You should note that to use advanced scaling in, you would be looking at just one of the highlighted areas. Market direction is up but the price retraces slightly during the trend. Market direction continues but the price retrace again. The market retraces again before continuing. To identify retracements in a downward trending market, look for areas where the price lifts slightly before continuing its downward swing. To use advanced scaling in, start by entering a trade using just a small portion of the money you ultimately want to trade with. If the price moves in the opposite direction to your trade and you believe it to be a temporary retracement, place another small trade in the same direction as your original position. Then, if the price moves in the opposite direction to the one you were hoping for and you believe this to be a temporary retracement, add to your first trade with another modest-sized trade in the same direction. This gives you a better average position in the market once the price eventually changes direction and the trade goes in your favour. The trader initiates a long position. A further position is entered as the price moves against the trade. A third position is opened as the price moves against the trade. 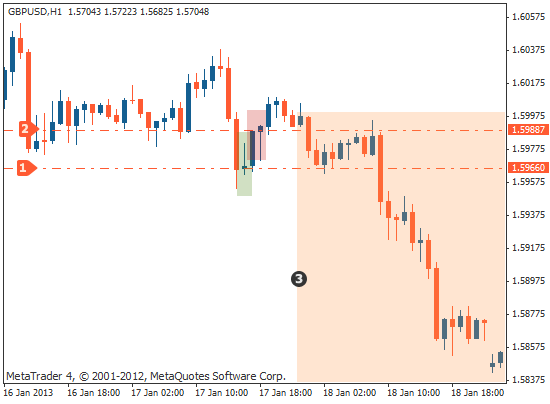 As you can see, after the trade is entered, the price reverses and drops. This pushes the original position into a loss. At this point, the trader enters a new long position and continues to do so several times at pre-determined intervals as the price moves against the trade. The trader initiates a short position. A further position is opened as the price moves against the trade. The market reverses and both positions are in profit. In this example, the price once again moves against the initial entry point, allowing the trader to open a second position in the same direction as the first trade. This gives a much better entry point for a sell trade before the price continues on its downward course. If the initial entry is larger than subsequent entries, it is known as an aggressive entry. It is higher risk but also offers higher potential reward. 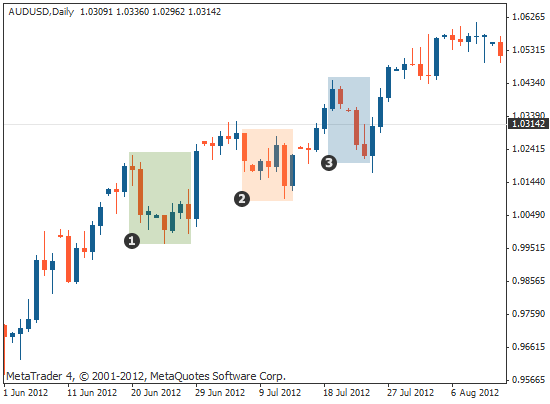 You enter your largest position as the initial entry and then for further entries you scale the position down in size. The reason why this is called aggressive, is because at the time of entry, you do not yet know if the price will go in your favour or not – you may not know at this point if you will be using advanced scaling in or the usual method of scaling in. For this reason, it is aggressive because you enter your highest position first without knowing how the price will develop. A conservative initial entry is when each position is of equal size. You must note that in order to use advanced scaling, you must have a significant reason to believe the market will continue on in the original direction. Advanced scaling in should not be used in a non-trending environment, when prices are choppy or ranging and do not move in any clear direction. Advanced scaling in should only be used when you have a strong reason to believe that a price will ultimately move in the direction of your trade. Only use it in trending markets. There are various techniques that you can use to make sure you are trading in the right conditions. For example, you can use multiple time frame analysis to determine an overall market direction on a higher time frame and enter your positions on a lower time frame. You can also make use of moving averages to confirm that the price is trending. There is no fixed rule as to how many trades you can enter when using advanced scaling in, but you must never risk more than 2% of your account in total. You should also note that aside from having a reason to believe the market will continue on in the original direction, you must also have a reason to enter into each position within the actual retracement, such as when you observe a candlestick pattern or if the price finds support or resistance. In other words, you should not simply randomly enter further trades when the market is moving against you. advanced scaling in is a technique whereby traders enter a position in stages while the price is actually moving against the direction of their trade. it can help you take advantage of retracements to achieve a better average entry price for your overall trade before the price moves in the direction you want. to identify retracements in an upward trending market, look for areas where the price drops slightly before continuing its upward swing. to identify retracements in a downward trending market, look for areas where the price rises slightly before continuing its downward swing. to use advanced scaling in, start by entering a trade using just a small portion of the money you ultimately want to invest in that direction. if the price moves in the opposite direction to the one you were hoping for and you believe this to be a temporary retracement, add to your first trade with another modest-sized trade in the same direction. the initial entry when using advanced scaling in is known as the aggressive entry and tends to be bigger. subsequent entries are called conservative entries and tend to be smaller in size. advanced scaling in is best used as part of a trend-following trading strategy and should not be attempted in a non-trading or range-bound market. it should only be used when you have a strong reason to believe that the price will ultimately move in the direction of your trade, and only in combination with stop losses.